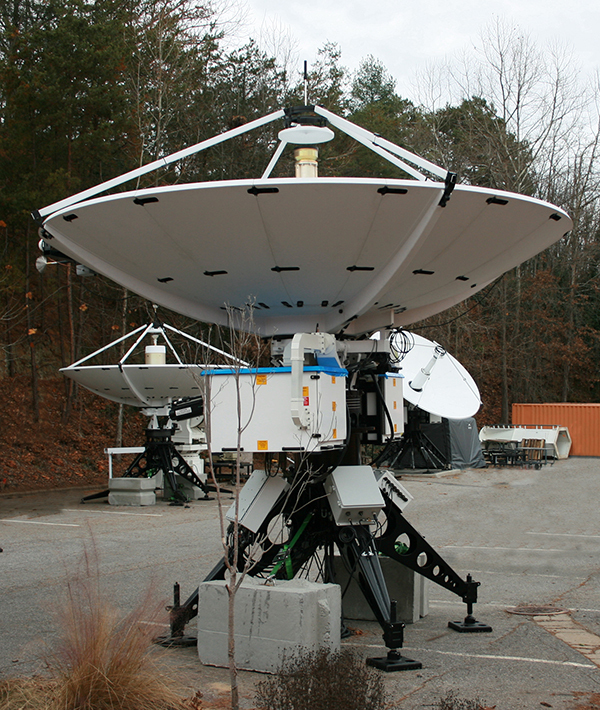 The AvL 4600FA is a high-gain multi-band antenna that can be assembled by a four-person team in less than three hours. The antenna packs into 24 FedEx-ready cases (excluding feeds), and the cases meet two-man lift standards and stack neatly onto four pallets. The antenna is commercial air freightable. The axi-symmetric ADE carbon fiber reflector is segmented into 17 pieces for easy assembly and pack-up. The antenna operates with an AvL Cable Drive positioner for azimuth and a machine screw for elevation, and the mount geometry is elevation over azimuth. Polarization is managed with rotation of the feed. The antenna operates in standard C-Band (LP or CP) or INSAT; optional operation in extended C-Band, C-Band Troposcatter, Ku-Band (LP), Ka-Band (LP or CP), X-Band (CP), S-Band or S/L-Band. Feeds are interchangeable from the back of the center panel. The antenna is ultra-stable under solar loading. Options include an Ethernet remote interface, inclined orbit step tracking and TLE tracking.